Superyachts, celebrity athletes, submarines, stunt shows, entertainment and exciting on-water experiences set to thrill for visitors. The Dubai International Boat Show located at the stunning new temporary location at the mouth of the Dubai Canal near Dubai Ladies Club, the 26th edition of the Dubai International Boat Show, taking place from February 27th to March 3rd, will host 20 luxurious superyachts, including the 86-meter Chakra by Scheepswerf Gebr. V and 72-metre Serenity from Austal. The show will also feature global and regional launches from 43 of the industry’s leading companies including Ferretti Yachts, Riva, and Pirelli. The 2018 edition of the Dubai International Boat Show will feature 845 companies and brands from 61 countries, including debuts appearances by 98 companies including Mangusta, the Italian manufacturer of luxury long-range yachts, Sovereign Sean Hermes, the Greek luxury yachting boutique company, Italian powerboat manufacturer Tullio Abate and Rolf Lang Dresden, the Germany-based manufacturers of marine chronometers. Excitement is guaranteed thanks to flyboard stunt shows by international extreme water sports athletes Bo Krook and Manea Al Marzooqi, while top American slackline walker Alex Mason will dazzle the crowds with his amazing feats of balance and daring. Visitors will also be able to take part in the Seakart Time Attack speedboat experience see the incredible Seabreacher submersible vehicle in action. Exhibitor at this year’s show will include leading companies such as Art Marine, Seabob, Gulf Craft, and AMELS, which will display their range of maritime products along with brands from across the region and the globe for five days of networking and deal-making, confirming Dubai’s status as one of the world’s most important leisure marine hubs. Co-located at the Dubai International Boat Show will be the Dive Middle East Exhibition (DMEX). Taking part in DMEX will be UAE companies Al Boom Diving, PADI EMEA, Divers Down and Scubatec, alongside international names including Amit, a distributor of diving brands including Gull, SEAC, and Yamaha’s Underwater Scooter. Also returning this year will be the Supercar Promenade, which will offer visitors the chance to experience the latest luxury vehicles, while the ever-popular The Beach venue will once again serve up great food, drinks and entertainment for the whole family. To add to the onshore entertainment, the Dubai International Boat Show has teamed up with Dubai’s trendiest beach club, Nikki Beach will keep the over 21s entertained with live DJ performances when the sun sets. Visitors can also take part in the DXB Paddle Race which will see 150 people compete in kayaks, stand up paddle boats and canoes. The show will also host the Build-A-Boat competition, which promises to be great team-building fun for water lovers. Getting to this year’s Dubai International Boat Show has never been easier. 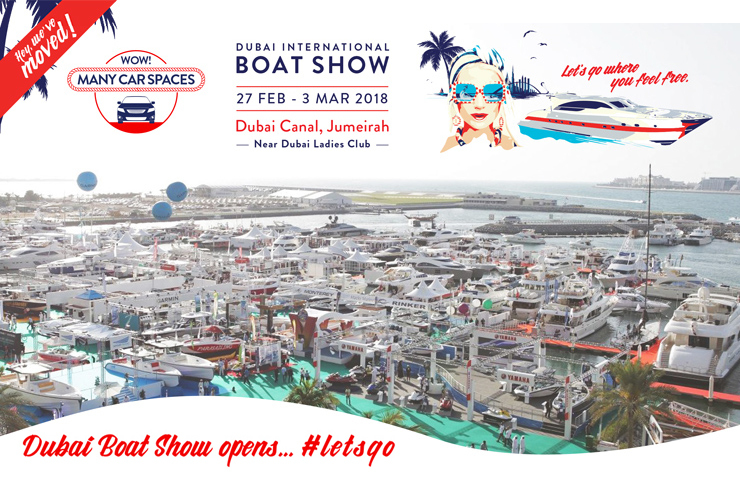 Free visitor parking is available at the show’s temporary location near the Dubai Ladies Club in Jumeirah, while bus and water taxi stations are located nearby from Al Habtoor City Marine Transport Station at the Dubai Water Canal. Now in its 26th year, the fun will come in all shapes and sizes thanks to an exciting new temporary location at the Dubai Canal in the heart of Jumeirah, stunning superyachts, sailing and speedboat experineces, high-flying stunt shows and great entertainment for the whole family. This year’s show is also the ideal platform for the launch of amazing submersibles, yachts, water sport toys and much more. (Trixie LohMirmand, Senior Vice President, Exhibitions and Event Management of Dubai World Trade Centre). The 26th Dubai International Boat Show at the Dubai Canal is open to rade visitors and the public from 3pm – 9.30pm daily from Feb 27th to March 3rd, 2018. Tickets will be available at the gates priced at AED 65 each.